This oyster stew recipe is sort of my flagship recipe, partly because of this blog’s name, and partly because I’ve been perfecting it over the years and it is really, really good. It also encompasses the best things about food, for me: simplicity, fresh and local ingredients, historical and cultural importance. In one pan, cook the shallots in milk over a low-medium heat. When they get close to boiling, turn down the heat and let them simmer. In another pan, cook the oyster liquor and water. When the liquid bubbles, add the oysters. When the oysters ruffle, add the butter. Stir lightly until the butter is melted. Mix together the contents of the pans. Simmer on low for a while, then serve warm. Be sure to get a good whiff of it before digging in. Drain the liquor from 2 quarts of oysters. 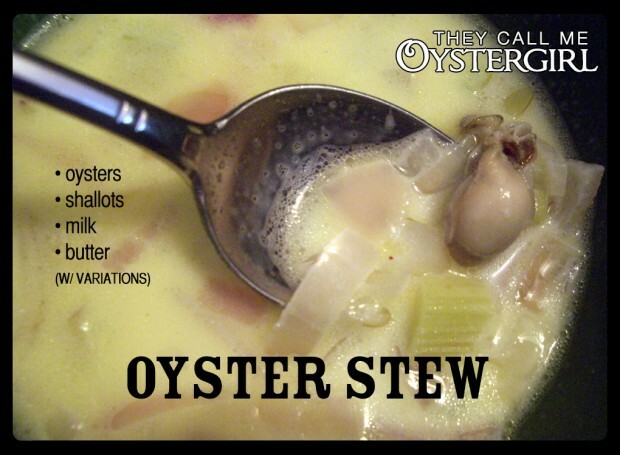 Mix it with a small teacupful of hot water; add a little salt and pepper; set it over the fire in a granite saucepan; let it boil up once, then put in the oysters and let them come to a boil. When they ruffle, add 2 tablespoonfuls of butter; when melted and well stirred in, add a pint of boiling milk or part milk and cream. Take from the fire and serve with oyster crackers. If a plain stew is liked, add boiling water instead of the milk and more butter. Because the oyster flavor (primarily from the liquor) is the real highlight of this stew, I find that the simpler the recipe, the better. That said, some variety is nice. Traditional variations include cayenne or paprika, celery or celery salt. I’ve also experimented with adding leeks (in place of the shallot), kelp noodles (nice due to their neutral flavor and ability to soak up goodness), and fresh herbs (sparingly; rosemary and thyme are recommended). I pretty much always get my oysters from the Matunuck Oyster Farm (now also a ridiculously good restaurant), in my home-state of Rhode Island. Theirs are the best oysters I’ve ever had, with the possible exception of those from a farmers’ market in Galway City, Ireland. I’d have to taste them at the same time to declare a victor, and that will never happen, because of course they’d have to be at their freshest possible. I’ve been hankering to try this for ages, and fate finally turned up the necessary incredients; we went with your basic recipe this first time — using about a pound of shucked oysters & liquor and two large shallots (all from the Dorothy Lane Market, in Dayton, OH), and likewise the double portions of half&half and butter. It smelled wonderful as it simmered (always a good sign), and tasted even better — flavorful, savory, and quite rich, but in a subtle and very pleasing fashion! We are certain to be trying your suggested variations whenever we get a chance to get out to Dayton — thanks very much for this delicious dinner suggestion!